I liked that Antonio! Perfect log with my morning coffee! The doors of Goodman’s quarters opened while the light from the corridor infiltrated the room’s darkness. A mysterious figure entered somehow without making a single noise, and quickly made its way to the Ensign’s personal computer. Pressing the only button of the device, it emitted a robotic beep and started displaying the latest sensors modifications that Goodman and Afiza were working on. But that wasn’t what the intruder wanted. The computer’s almost musical beeping shifted to a minor tone, robotically expressing its disapproval. Calmly, the figure extracted a tricorder from his pocket and after a sequence of button presses it reinstated the request. The voice morphed into a glissando, from its default feminine voice to something similar to a Borg, then back to its original one in a matter of seconds. The screen refreshed to what seemed to be a letter, but several parts appeared to be missing. Finally showing their first emotions, the figure tried to point it out to the soulless machine. “Then why am I seeing several redacted things on the screen?”, they asked, annoyed. The computer elaborated the request with an uncharacteristic beep typical of more complex situations. “By whom?”, the snooper asked. After several moments contemplating what to do next, the intruder decided to read what was left of it. When you’ll read this I’ll probably already be assigned somewhere else, killed in action, or located far away anyway, and it is only this distance that gives me the courage to tell you the truth. I’m not capable of seeing you anymore without wishing to hug you, and then continue that hug. I can’t look you in the eyes without hoping that your stare is actually just for me. “Interesting...” the person commented. "When was the file created?" "That information is not available," the computer replied. The sound emitted from their tricorder distracted their attention. “Damn, he’s coming here,” They thought while quickly turning off the computer. Then, after tapping the commbadge, they vanished into thin air. 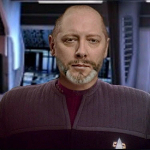 Goodman returned to his quarters after a long shift, his head still filled with sensor data, computer simulations and scenarios. As soon as he stepped into the room, however, he noticed something was not right: the computer on his desk was active and blinking. He always either turned it off or locked it before leaving, and he very rarely forgot to do those things. After all, it was recommended by Starfleet protocol. He carefully proceeded to check the contents of the screen, and as soon as he read the first words, his mouth went dry and anxiety kicked in like a runner after the start. “I definitely wasn’t looking at that before I left, so...” he started thinking out loud. “That information is not available”. “Alright, so it must be someone from the crew, as we haven’t invited anyone over yet”, Goodman began analysing while pacing around the room at a steady, yet heavy pace. He stopped and stood still, quickly realizing what was probably happening. His expression turned from serious to happy, and his body responded with a rush of relief. He started laughing, figuring how that letter could be interpreted as misleading through the eyes of someone who didn’t know his past. He connected the dots and figured that, after all, being seen exiting the door of Lieutenant Commander Danann’s quarters at an unusual hour would have probably fuelled up some gossip. And that would also explain the strange behaviour by the crewmen that he met in the previous days! The Italian ensign was uncertain on how to proceed: theoretically, what happened with his quarters and his computer would still be a rather serious breach in his personal life that could lead to consequences. Still, he had to applaud the efforts of this mysterious crewman who managed to cover his traces pretty well, except for the quite significant detail of leaving the screen on. He thought that reporting the incident would probably spark even more gossiping, even though nothing actually happened between Niamh and Anthony. He would probably ignore this and see how the situation evolved, smiling at the possibility that she would also be affected by it. In fact, he began to wonder whether something similar was happening to her, maybe in a lesser form, as if someone actually told her explicitly what people were thinking they were doing, and Goodman laughed again imagining her reaction. Surely she would find nothing wrong in some harmless fun, right? He thought.